Thread: Kratom : : anyone using or try it ? In cultures where the plant grows, it has been used in traditional medicine. The leaves are chewed to relieve musculoskeletal pain and increase energy, appetite, and sexual desire in ways similar to khat and coca. The leaves or extracts from them are used to heal wounds and as a local anesthetic. Extracts and leaves have been used to treat coughs, diarrhea, and intestinal infections. Kratom is often used by workers in laborious or monotonous professions to stave off exhaustion as well as a mood enhancer and/or painkiller. In Thailand, kratom was "used as a snack to receive guests and was part of the ritual worship of ancestors and gods." The herb is very bitter and is generally combined with a sweetener. 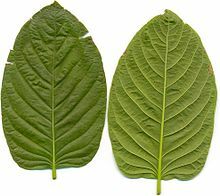 Kratom can cause addiction, withdrawal, respiratory depression and death. It can also cause psychosis. It's basically like mixing a dash of heroin with a touch of methamphetamine and some unknown alkaloids and hoping for the best. My husband has been using it. It does have opioid effects, but milder. It does seem to cause some discomfort when he doesn't take it. Also to me seems like it's giving him some sort of "rebound pain syndrome" , like narcotics can, but that could just be his normal pain level i guess. I don't think it's any miracle. It gets him off the couch, but he was "addicted" to oxycodone for years and is now not taking it, so, as i mentioned in another post, it could be the mood altering effect that gets him off the couch. Wears off pretty fast. This might be meaningful of you backed the claims up with citations and links. AFAIK literally every single case cited (by the DEA who stands to benefit financially from every schedule 1 addition) that claims dangerous side-effects involved the simultaneous use of multiple, dangerous drugs. If you can find any citations showing such effects from taking only kratom then please provide them. I do not believe kratom to be dangerous to anyone other than the makers of opioids. With that said, I tried kratom but got no relief. This is likely because my pain is predominantly central cord (nerve) pain which doesn't respond to conventional pain killers. I tried it, did 7 grams, it didn't do anything. I still have some, perhaps I should try it again.